The experience of teaching English here has been both fantastic and exhausting. I’ve found that, to give a good lesson, one really needs to be ON 100% of the time (especially in the conversation-type lessons I’m teaching, which involve little or no downtime during which students are writing, working on their own, etc). This is the exhausting part. On the other hand, my lessons (with adults) have been invaluable opportunities to learn about the Japanese culture and way of life. In my adult lessons, we’ve discussed topics ranging from politics to marriage to Formula 1 racing. ‘Discussion questions’ like “What is the most important thing to accomplish in one’s life?” and “What is the typical family in Japan, and what are the family members’ roles?” have given me insight into priorities, thought processes, and cultural norms here that in many cases set Japan far apart from Western countries. My English lessons have sometimes been more of a lesson for me than for my students. This is the fantastic part. While my lessons with children tend not to reach the same cultural depths, the lessons have affirmed my love for teaching kids. There is a special kind of joy that I’ve found comes with watching something ‘click’ for a kid before your eyes. Teaching ‘Head, Shoulders, Knees, and Toes’ and then playing the tricky “Touch your head! (I demonstrate by touching my head) Touch your toes! (I touch my toes) Touch your shoulders! (I touch my knees)” game has been a blast. 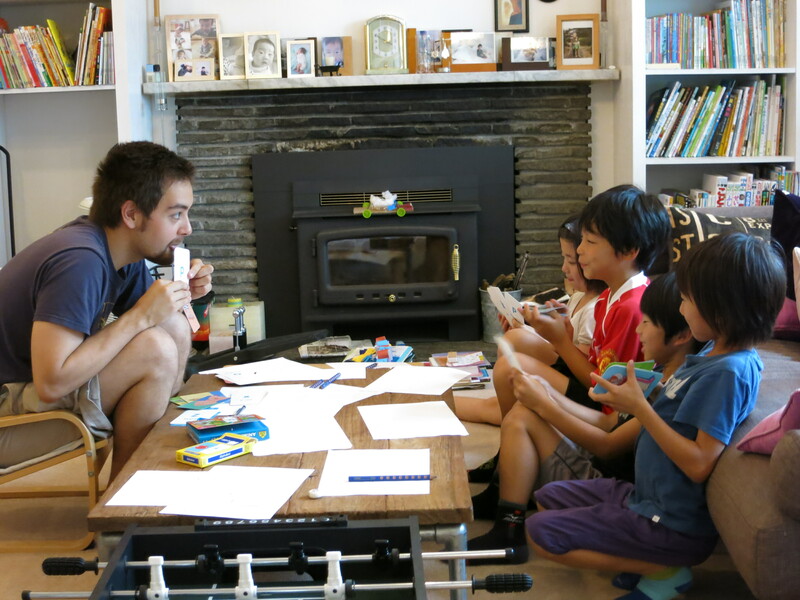 As of this coming Thursday, my time teaching English here in Japan will be over. Next week, I will travel north of Tokyo to be a councilor for a wonderful American/Japanese camp in the mountains (for one week). Afterward, I will spend a week traveling alone and then one week back in Tokyo visiting with my dad, who is coming to visit! 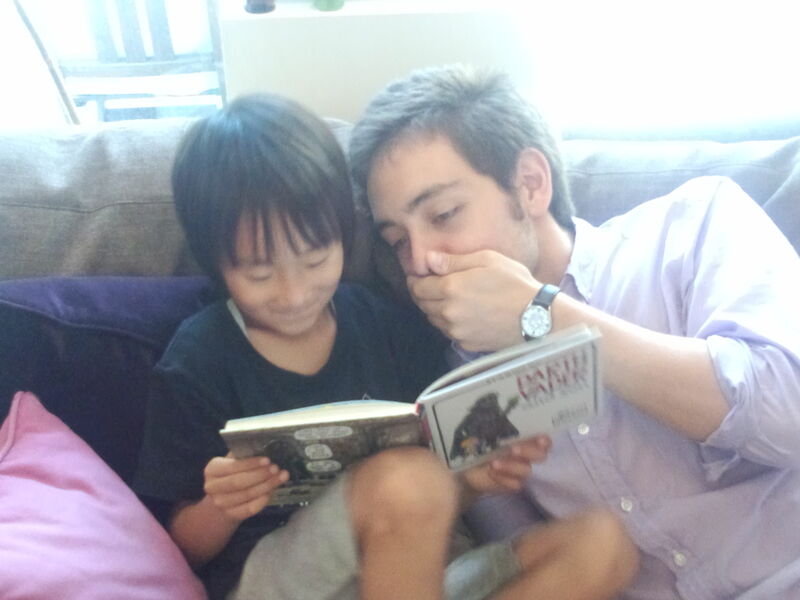 Two of my students (brother and sister) during my stay at the Fukudas. Sibling students plus books (for the purpose of looking as academic as possible) and Rinta! 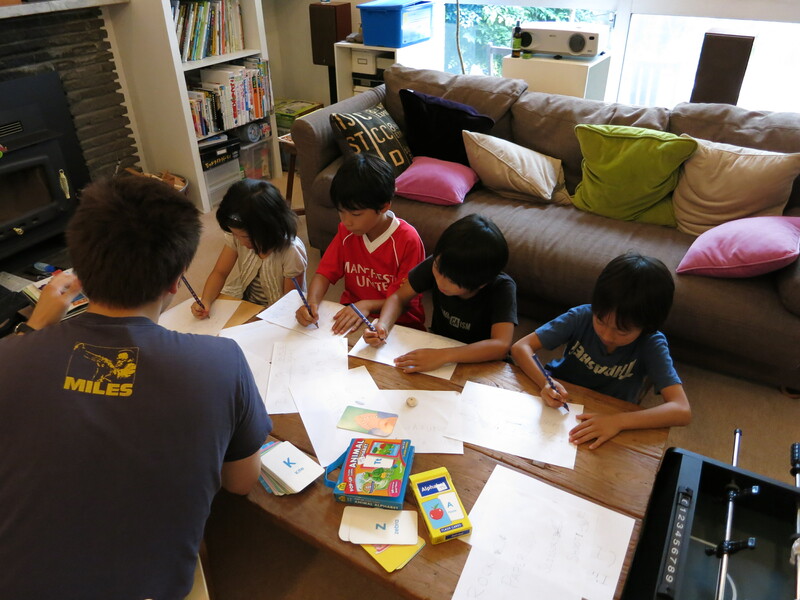 Teaching a group of four kids, including Rinta, at the Fukudas. 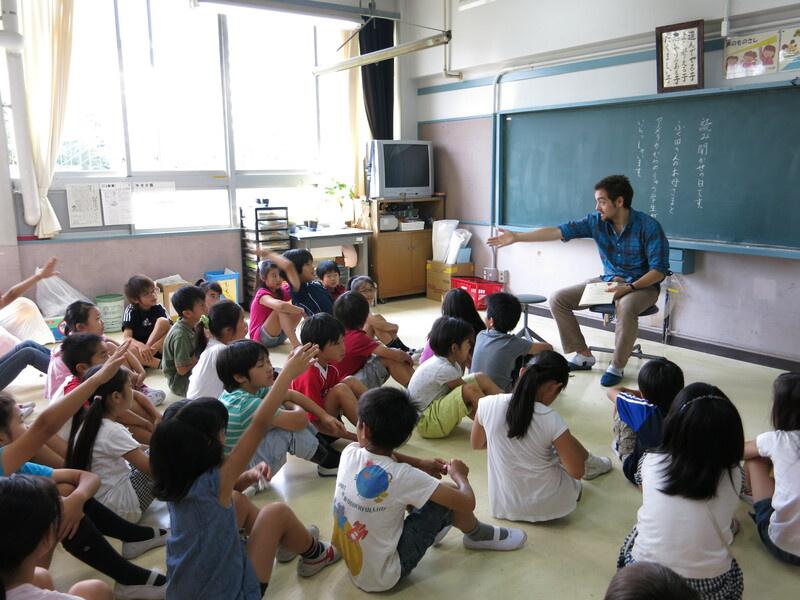 These last two are from a visit I made with my host mother to Rinta’s school. 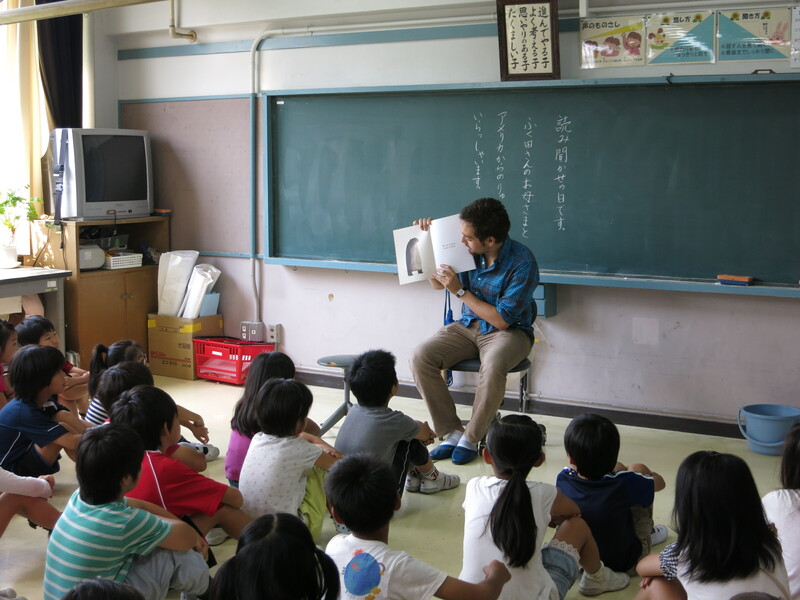 Once each month (I think), a parent comes to school in the morning and reads a story in Japanese to his/her child’s class. It was my host-mother’s turn while I was staying with the Fukudas, and she turned her spot over to me. I spent about 10 minutes reading a fun picture book called “I Want My Hat Back” and then answering lots of questions about where I’m from, what I like to eat, etc. Such fun. I’ll miss teaching when it is over! It’s considered bad form to refer to yourself as “sensei.” You should use the word “kyoushi.” Good luck in Japan!